As most of you know, I started my weight loss journey in the fall. I'm not going to lie, it has been HARD! But, that is all my fault. It is not the result of the program I am doing. The hardest part for me is just how busy we are. We eat out a LOT and I don't always make the best meal choices when we are out. A few days ago, I was invited to try Healthy Choice Top Chef Cafe Steamers and Healthy Choice Greek Frozen Yogurt. I headed to Walmart and picked up the Healthy Choice Crustless Chicken Pot Pie and their Dark Fudge Swirl 100 calorie treat. We have 2-3 days each week that we are running nonstop almost all day. I just don't have time to fix dinner on those days, I hardly have time to breath! So, those are the days we eat out. Those are the days that throw me off track. I decided a few weeks ago that one of those days I CAN cut back a few things and take time to make dinner for my family. My time is still tight so my meals not only need to be quick, but healthy. I HAVE to get back on track! At one point, I had lost 20 pounds. Since then, I have gained and lost about 3 pounds. I am currently down 18 pounds from the day I started. Which is GREAT! But, I still have a LONG way to go! I really enjoyed the Healthy Choice Crustless Chicken Pot Pie and will purchase it again. I was worried I would miss the crust but, they include yummy dumpling pieces in the meal to make up for the missing crust. I still find it hard to resist sweets. My friend, Rachel, has been making a LOT of ice cream cupcakes recently and that inspired me to try this twist! 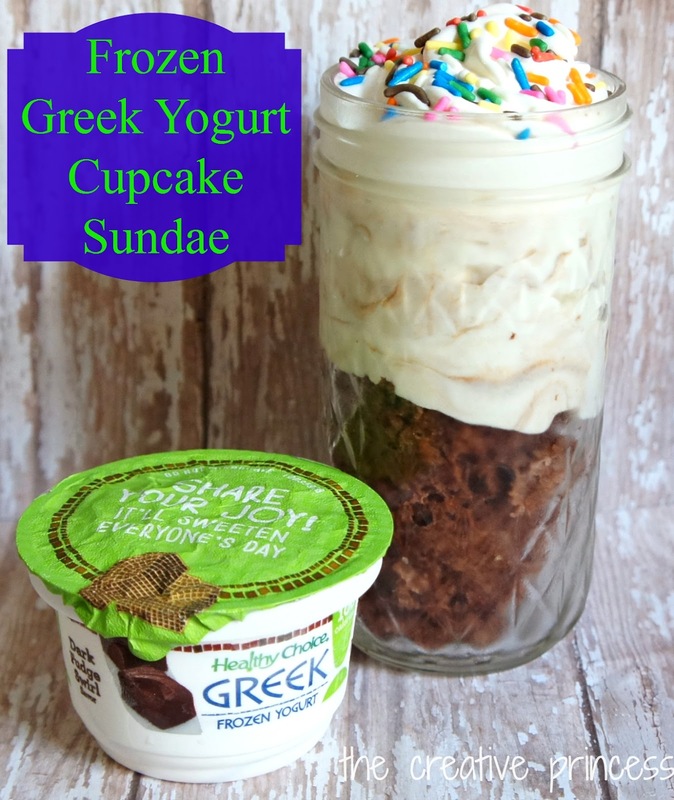 I love Greek yogurt and was excited to find these Healthy Choice Greek Frozen Yogurts! They were exactly what I needed for my twist on the ice cream cupcakes! Prepare 321 Cake as directed in recipe and allow to cool. Allow the Greek Yogurt to melt just a bit, just let the cup sit at room temperature for a few minutes. Once cake is fully cooled remove from mug and cut in half. Place each half in separate bowls or jars. 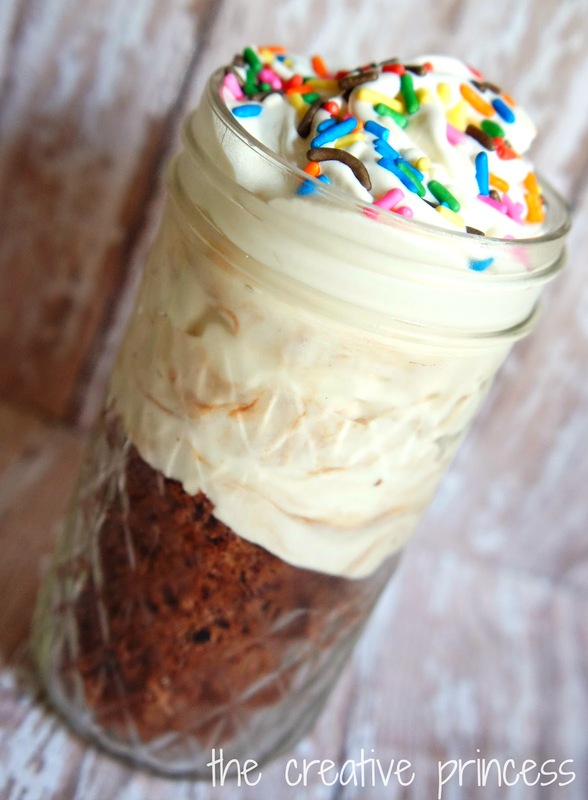 Spoon half of Greek Frozen Yogurt cup over each cake and top with Whipped Topping. Place in freezer and allow to refreeze, I left mine in for about 30 minutes and it was great! *You can also place these in jars and keep in your freezer for a great, quick, treat! Having NEVER tried Healthy Choice products I was SHOCKED at how much I liked them! I don't know why I had always passed them by but, no more! They were a lot better than the regular healthy freezer meals I usually buy. I can't wait to try more flavors! Luckily, the meals are a great value and with the coupon that is out now (check it out to the right), it makes Healthy Choice meals and treats and even better deal! I am a member of the Collective Bias® Social Fabric® Community. This shop has been compensated as part of a social shopper insights study for Collective Bias® and ConAgra Foods #cbias #SocialFabric All opinions are my own!